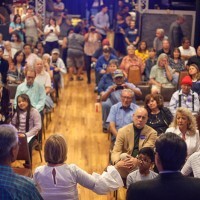 The Gallup Downtown Conference Center hosted an eager crowd on Aug. 31 as part of the statewide bus tour for Democratic New Mexico governor candidate Michelle Lujan Grisham. 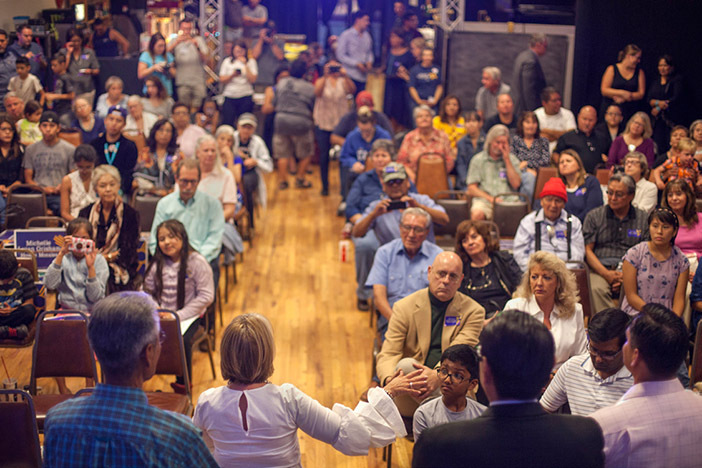 Lujan Grisham and her running mate, Howie Morales, spent nine days touring New Mexico, holding a number of public events that ranged from meet-and-greets to meals. Alray Nelson, the Native American outreach director for Lujan Grisham’s campaign, spoke to the crowd about the need to move on from failed, ineffective leadership. “We need someone to bring us together, fight for families, break down walls,” he said to the room. The event in Gallup drew in an array of government figures and candidates running for office. This included Kristina Bogardus, one of five women running for different seats on the Court of Appeals, New Mexico Sen. John Pinto, D-Tohatchi, members of the Zuni council, and others. Several people spoke on behalf of Lujan Grisham’s efforts. Henderson, a member of the Diné Chamber of Commerce and part-time teacher at Diné College, said businesses and community plans are at their forefront. Henderson said obtaining the funds to work on these projects is difficult, as the people behind such projects have no collateral. He cited the dual taxation of the state and Navajo sales tax as a reason why only one percent of Navajos are self-employed; he said they aim to grow that private sector through collaborations. “We’re all in this together, to state, local, county government,” Henderson said. The owner of Oops A Daisy Floral, a Navajo-owned business in Window Rock, Ariz., said business owners like herself came to the rally because they are being afflicted and must be proactive. Bedonie said she began to trace where her business money goes and found that for every dollar she receives, 35 cents go to up to eight different taxes; 27 cents to utilities; 20 cents to rent; and 17 cents go to commercial health insurance. In the end, Bedonie was left with one cent toward everything else that must be done. She said business owners need help, and they are looking to tribal government to alleviate the taxes. “The people are the most important resource,” she said. Navajo Nation Presidential Candidate Joe Shirley Jr. The former Navajo Nation president said the efforts of Lujan Grisham and Morales will help state and tribal governments obtain a more respected position on the national political scene. He said the current government administration does not give tribal groups like the Navajo Nation the attention and respect they deserve. Shirley said he appreciated the enthusiasm in the room and hoped it would translate into a large turnout at the general election in November. “Every vote counts,” he said. Colón spoke of his experience tracking tax dollars through his background in finance, his law degree and his love for New Mexico. His words and energy elicited a number of laughs from the crowd. Colón said half of the items on the general election ticket will be related to education and a system that will serve the people in the room as well as their children. “[We will] fight for the children in this room, because they are our most important priority,” he said. The Navajo Nation presidential candidate was one of the first tribal leaders to stand behind Lujan Grisham, and said he was there as part of the initiative to move forward and work together. “We need to let people know we need [Lujan Grisham],” Nez said to the room. He spoke about the importance of magnifying the candidate’s message. “We have to let the folks know how [Lujan Grisham] has worked with grassroots people to make changes in healthcare, public safety,” he said. The candidate for lieutenant governor of New Mexico spoke about the impressive turnout from 33 counties in nine days. Morales said their tour will convey the message that every county, city, town and person matters to the campaign. “[We have to] get leadership where it needs to be — serving the people,” he said. Rep. Michelle Lujan Grisham, D-N.M. When the candidate for governor took the stage toward the end of the rally, she told the crowd she works for them and will make sure the state government does, too. Lujan Grisham said she’d sorted through veterans’ issues. Each month, she pulled anywhere from 50 to 100 cases that involved people getting access to the care they needed. “[The] state can make a difference in all of those areas, as long as the governor makes them a priority,” she said to the room. Lujan Grisham said the current political agenda leads to deadlocks on a number of issues, like veterans affairs, and to few opportunities for families. “[We can] create jobs by creating a vehicle and pathways, create an ecosystem,” Lujan Grisham said about plans for the state. She added that nothing would be left behind. “Governors ought to be the No. 1 advocate for their state,” she said. According to Lujan Grisham, the state’s assets and potential are higher than those of a number of other states, but governors must work together to utilize them. “If any state can get it right, we can,” she said to the room, urging attendees to get the message out. The New Mexico representative said the public is ready for a new beginning, and a 12th-generation New Mexican like Lujan Grisham is a good choice because of the time she spends helping others. “She understands the importance of family roots, the connection to our land, our sovereignty, generational ties that are there to this day,” Johnson said to the room. She praised the work ethic Lujan Grisham showed at the 2017 Navajo Nation Fair parade. The last speaker of the night and chair of the House Appropriations & Finance Committee for New Mexico spoke about how they have not had enough people to work with on numerous projects, and that motions involving money intended for Navajo chapters were vetoed. Despite such difficulties, Lundstrom said she will keep working. Change, she said, will happen when ineffective leaders are removed. “We need them as soon as we can get them,” she said of Lujan Grisham and Morales.